The act of giving back to the community is sometimes called philanthropy, community service or corporate goodwill but it is well known in the business world today as Corporate Social Responsibility –CSR. GK sees CSR as a vehicle for nation building, an instrument of hope, and a stimulus for economic growth. Done through the GK way of sharing and caring, CSR translates to social justice: sheltering the homeless, feeding the hungry, building productivity and creating abundance for all. We have observed that for CSR programs to be effective and sustainable, it must serve the interest of both the giver and the receiver for the sake of the common good. Corporate funding must trigger counterpart service from those who are being helped. Through the GK way, CSR resources not become mere dole-outs but are matched with the communities’ sweat equity and the time and talents of our volunteers. This way, you will know that your company is not only making a financial contribution but a real difference in the lives of the poor by empowering them to build a brighter future with your help. As companies give, they not only foster goodwill but also open up new markets and attract loyal customers from the people they have helped who will support their products and services and pass their goodwill to others. CSR helps the community and promotes good business at the same time. 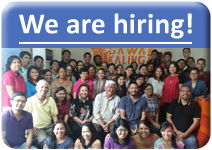 There are growing heroes in business who are helping the poorest of the poor with Gawad Kalinga as their partner. Shell, Philips, HSBC, Nestle and Unilever are European companies that saw value in our holistic development template by providing typhoon resistant homes for calamity victims, programs for education, health and nutrition for the children and livelihood for adults. This was not simply a matter of funding, but of sustained volunteerism usually led by their CEO and the top management team; not just a one time, big time season of service to the needy, but a consistent championing of communities that carry their corporate branding at the gates and in the grateful hearts of the residents. Other American companies – Procter & Gamble, Colgate, Pfizer, Citigroup, McDonalds, Microsoft Corporation, Bank of America, Lexmark, IBM and Convergys among many others have taken on programs with GK according to the needs of our communities and their corporate interest; likewise for Telus and Sunlife of Canada. The CEO of Procter & Gamble, Jim Lafferty, spends some of his weekends serving a poor GK community outside Metro Manila with his family. This is beyond CSR; this is genuine affection for our people. CSR has also become standard practice for Asian brands: Hyundai, Nissan, Fuji Xerox, Ascendas, CapitaLand and Sumitomo are among those who support GK’s cause. Enlightened capitalists have become patriots and friends of the poor. These companies are in our country for business, but their new bottom-line is profit with a bigger social conscience. They also inspire their employees to volunteer and render patriotic service with corporate support. In a sense they have made nation-building integral to their business plan. Our corporate partners give us what is of highest value to our cause – credibility. Public trust in us is reinforced by strong corporate co-branding. Big business will not partner with us without due diligence; they will not risk their corporate image if we do not have integrity. In our setting, credibility is essential to attracting more partners and sustaining long term relationships. As we are paving the way for companies to give back to poor communities in the Philippines, we are also incubating initiatives in Cambodia, Indonesia, Papua New Guinea, East Timor and soon in India and Malaysia with the help of local partners, building along their cultural and faith values. There are growing heroes, among them enlightened businessmen, that will make developing countries rise by restoring the dignity of their greatest wealth – their people. GK provides the best avenue for this, providing companies the opportunities to help the poorest of the poor whose great potentials are waiting to be tapped and harnessed.